For many people, sharks and rays are regarded with fear, but for young marine biologist Melissa Marquez they inspire admiration, respect, and an entire career. Marquez raises awareness about chondrichthyans(the class to which sharks, skates, rays, chimaeras, and cartilaginous fish belong) through her foundation The Fins United Initiative. Marquez has a BA (Hons) degree in Marine Ecology and Conservation from the New College of Florida, USA and an MSc in Marine Biology from the Victoria University of Wellington, NZ. Marquez is also a passionate science communicator and believes in creating opportunities for women in STEM, especially for those from Latin backgrounds. As a result of her incredible work in marine biology, she was invited to give a TEDx talk in 2017 in Wellington. Obviously, we were curious to learn more about her and her journey towards becoming an expert on the most infamous creatures of the sea. I hold a Bachelor’s degree in Marine Ecology and Conservation from New College of Florida, USA and a Master’s degree in Marine Biology from Victoria University of Wellington, NZ. PP: Tell me a little bit about yourself and especially what lead you to this path that you are on now? How did you end up in such an offbeat, unconventional and fascinating career? MM: I grew up in the tropics in the Caribbean and this heavily influenced my love for marine life as a child. My introduction to science was through my mom, who was a scientist, and she encouraged me to develop my own passion for science, as well – although my parents might have been happier if I had stuck to something manageable with less teeth instead of chondrichthyans! During my university years, especially in 2013, I had filmed videos of the research I was doing to send back to family and friends. This was my first foray into science communication. I am actively engaged in research, exploration, communication, and application of scientific knowledge related to the conservation of marine ecosystems. I study sharks and their relatives (the skates, rays, and chimaeras). I’ve always had a fascination with misunderstood predators and these tend to be the most demonised. Specifically, I look at their migratory patterns and habitat use – answering why they are where they are. I’m also interested in how media portrays these animals and how that sways conservation efforts. Why did you choose to become a scientist? I am fascinated with the natural world– especially the ocean! I just wanted to learn more about it. I grew up watching David Attenborough documentaries and The Wild Thornberry’s on Nickelodeon. I guess you could say that Eliza Thornberry was who got me interested in biology, as I was envious of her ability to communicate with animals. I wanted that super power- to ask animals where they went, why they did what they did, etc. David Attenborough brought it to life for me. Suddenly it was no longer just a cartoon I watched after school but an actual subject I could follow. The ocean had always captivated my heart, and these two people (one fictional and one so tangible) led me to the road, paved with role models like Sylvia Earle and Eugenie Clark. These people drove me to graduate high school and then pursue a Bachelor’s degree in Marine Ecology and Conservation. And this journey led me to pack my bags and move from Florida, USA to Wellington, NZ and get a Master’s degree in Marine Biology. My curiosity about the natural world was never satisfied, which is why I hope to begin a doctorate soon. When I say “shark scientist,” many think my days are filled with constantly being in the field. During the field season, maybe this is the case… but the rest of the time I’m either reading research articles, doing data analysis, or writing! Science is interesting in that no two days are ever the same—and you are always learning new things! PP: Tell me about The Fins United Initiative (TFUI) and what that journey was like? MM: While I was going to school in Sarasota, Florida, I realized people were disconnected from the wildlife in Sarasota Bay. During that time, I self-published a book on sharks, skates, and rays in Sarasota Bay and a teacher asked me to give a talk to the kids. I realized there was a big gap between the education system and the environmental curriculum for schools. The program came along with me as I traveled around, and it became national, then international, and took on a life of its own. It grew from Sarasota Fins to The Fins United Initiative. PP: Why are you so passionate about what you are currently working on? What should people know that is important? MM: I am passionate about the diverse chondrichthyans and the diverse scientists studying them. When I was growing up I didn’t know anyone who looked like me, a Latina studying marine science. Especially on TV, they don’t show many female scientists studying these sharks. I am interested in shining a spotlight on this field so that girls growing up can see this as a viable future career option. I don’t want to look at a row of scientists and not see myself represented. I want to be a positive role model for young girls, especially Latinas interested in STEM fields. PP: What are any upcoming projects or plans that you are working on? MM: I am writing a bilingual book about science for young kids, where the main character Maria goes back in time to meet women in STEM. I am working on bilingual academic and career guides, such as how to prepare for conferences, set up resumes, and write cover letters. PP: What does the future of TFUI look like? MM: We are hoping to make it global and to have a physical center. People should keep an eye out as it is becoming a more collaborative enterprise – I believe we all can accomplish great things through cooperation rather than competition. PP: How was your TedX experience? MM: Terrifying! There were about 5000 people watching the talks. I was the last person in the lineup. Before I went on, I was listening to the musical soundtrack of Hamilton to keep myself energetic and motivated. Thankfully I had rehearsed my talk enough that I did get to enjoy the experience. My parents and friends also tuned in to watch from the States, so it was great to have that support. I had so many people come up to me to share their stories and experiences after the talk. PP: What is one of the most interesting things that happened to you on the job? Around this time four years ago I got stung by a bark scorpion (the deadliest scorpion in North America because go big or go home, right?) which paralysed my right hand and my right arm for around three weeks. My parents had a field day with that, as did my worrying professor(s) and classmates since I didn’t get antivenom in time. Just recently I got bit by an octopus (species unknown because they’re not an animal I study in depth, but it’s not the blue-ringed octopus) during a show-and-tell at the marine lab I volunteer. Her beak got me right at my wrist, between two veins (phew! ), as her tentacles wrapped all around my arm up to my elbow. Oops! Yes! The hardest part of my career has been how to turn rejection into motivation. As an early career scientist, and I’ve heard a lot of “no,” “this won’t work,” and “I’m not interested” which I at first took personally. But I took these challenges and turned them into feelings I could use to get fired up! What (or who) motivated you in difficult times? I’m lucky that I have a strong support system in my family, my friends, and my colleagues. The women I have in my life are full of intelligence, confidence, and determination, making them incredible role models for me. I have big dreams—I like having goals that scare me. I first and foremost want to continue my work with The Fins United Initiative, making it a true non-profit organisation with a structural home base that will act as an aquarium and research hub. 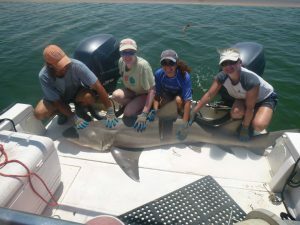 I also hope to get a Ph.D., focusing my work on marine outreach – making sure the public gets reliable information about sharks and their relatives (to help them better understand/back policies)! Some other dreams include joining many of my idols in being a National Geographic Fellow/Explorer, a Pew Fellow in Marine Conservation, a TED Fellow, a WEF Young Global Leader, and get in the Forbes 30 under 30. I’ve got some work to do, haha! PP: Do you have any advice for young scientists? MM: For the good or the bad, you need to be passionate about what you are doing. Nobody goes into science just to get rich. Don’t let people rain on your parade when it comes to your dreams!